Livisto Aluminium Spray is an easy-to-use, water resistant topical spray that creates a protective barrier against external influences in the wounds of large and small animals. It is the ideal product for the proper protection and healing of wounds caused by common injuries and accidents. Allowing for fast and easy administration, the Aluminium Spray protects hairless areas of the skin with a thin metallic, flexible film that while water resistant, will still allow the skin to breathe and significantly reduce the risk of infection. 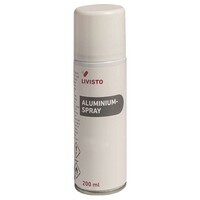 Livisto Aluminium Spray can be removed easily with warm soapy water to inspect the wound, and can be reapplied several times a day as necessary.